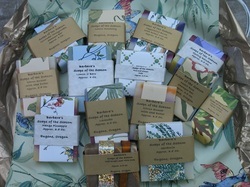 We went to Sedona about a year ago and I was so happy later to see a recipe for Ancient Sedona Soap. This is a lovely earthy smelling soap and I did my best to capture the red rock colors of Sedona. Those of you who have visited the area will find this bar really interesting and I think it's a great soap to share with your man in any case.